DANIELLE PERRETT has a firmly established career both as a soloist and as a chamber music player. Something of a prodigy, she gained diplomas in harp playing whilst still at school and the Royal College of Music Junior Department just five years after taking up the instrument. 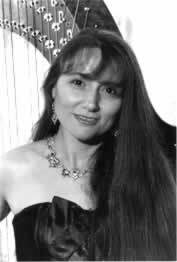 She studied with Daphne Boden and later Renata Scheffel-Stein and she can trace her harpist tuition lineage back to several of the great virtuoso harpist-composers of the 19th century. Subsequently, Danielle was the first person to gain a Master’s degree in Performance & Related Studies at Goldsmiths’ College, London University. She specialises in solo and chamber music on both modern and late eighteenth century harps and her recordings have been highly acclaimed.Her career has seen her perform solo and chamber music in the UK, USA, France, Austria, Italy, Ireland, the Czech Republic, Slovakia, Australia, New Zealand, Hong Kong, Malaysia, Japan, the Canary Islands, and Zimbabwe. She has also worked with students and their teachers around the world giving masterclasses and workshops as well as adjudicating. Danielle has broadcast a great deal internationally and writes articles and reviews about harp related and other musical topics. She composes, edits and arranges harp music as well as researching the instrument and its repertoire from the late eighteenth to the early nineteenth centuries. An examiner for Trinity College, London, Danielle devised their international harp syllabuses. Danielle’s interest in good posture and healthy performance practice also led to her becoming a qualified Pilates teacher and she specialises in teaching this to harpists and other musicians. She has adjudicated the UFAM celtic harp competition in Paris and the London Harp Competition. She is a liveryman of the Worshipful Company of Musicians. Karin Leitner was born in Vienna. She gained dilomas at the Academy of Music and Arts, Vienna with Prof. W. Schulz and at the Academy of Music Freiburg, Germany with Prof. R. Aitken and participated in Master classes with Peter Lukas Graf and Robert Aitken. Karin has won numerous competitions including Jugend Musiziert, Musica Juventutis, Forum Junger Kuenstler, and Talentinum. She has performed in solo concerts with the Vienna Chamber Orchestra, Vienna Mozart Orchestra, Austrian Ladies Orchestra, Camarata Musica, Philharmonic Orchestra Hradec Kralove, Bohuslav Martinu Philharmonic Orchestra, Orchestre Filharmonique de Besancon, Cape Town Philharmonic Orchestra and Capella Istropolitana Bratislava. Other solo recital locations include the main concert halls in Austria (Konzerthaus, Musikverein Golden Hall, Brucknerhaus Linz, Carinthian Summer Festival), Germany, Czech Republic, Poland, England, Wales, Ireland, Iran, USA, China, South Africa, , Switzerland, Holland, Hungary, France and Italy and concerts on the luxury cruise ship MS Europa. She is a tutor at the Sandor Vegh Symposium for woodwinds in Austria, and has given workshops and master classes in China, Iran, South Africa, Nepal and India, Ireland and Northern Ireland. Karin is under contract for the Stage Orchestra in the Vienna State Opera and works with the Royal Philharmonic Orchestra, BBC Symphony Orchestra and London Mozart Players. She has made CD Recordings and TV-recordings, and interviews and Radio broadcasts in Austria, France, Hungary, South Africa, UK, Ireland and the Czech Republic. She has also composed for flute, harp and string orchestra.